M. R. Hassani, P. S. Engels, F. Varnik. 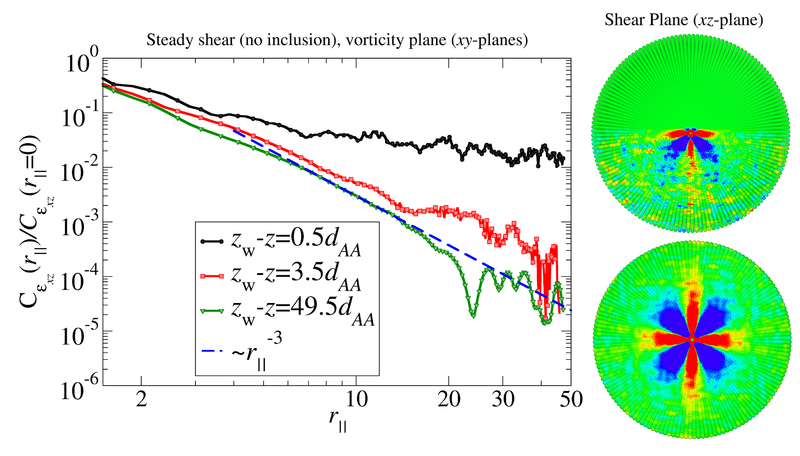 Normalized correlations of non-affine shear strain versus distance between two rearrangement events. The color maps on the right show correlations within the xz-plane close to the wall (upper image) and far away from it (lower image). Effects of hard planar walls with a particle scale roughness on the spatial correlations of non-affine strain in amorphous solids are investigated via molecular dynamics simulations. When determined within layers parallel to the wall plane, normalized non-affine strain correlations are enhanced within layers closer to the wall. The amplitude of these correlations, on the other hand, is found to be suppressed by the wall. While the former is connected to the effects of a hard boundary on the continuum mechanics scale, the latter is attributed to molecular scale wall effects on the size of the region (nearest-neighbor cage), explored by particles on intermediate times scales.